On page 1 of his 2006 Year-End Report on the Federal Judiciary [hat tip to WSJ Law Blog], Chief Justice John Roberts claims that lagging pay ($165K for a District Court Judge, $175K for a Circuit Judge, $203K for an Associate Justice, $212K for the Chief Justice, see here) has "reached the level of a constitutional crisis that threatens to undermine the strength and independence of the federal judiciary." (In the 2005 Report, judicial pay was merely a "direct threat to judicial independence.") The Chief Justice's statement is troublesome on its face. But it is also empirically problematic. First the text. Presumably, the "strength" of the judiciary would be undermined by reducing the number of prospective judges. Most law professors make less than $165,000 per year, as do virtually all civil servants and a large proportion of lawyers in private practice. This is a pretty deep talent pool. Why isn't it deep enough? The Chief Justice needs to explain how another $50K or $100K a year will attract qualitatively better judges and thus avert the constitutional crisis. What about "independence"? Are judges who endured an FBI background investigation and congressional hearings really going to curry favor with advocates or litigants in the hope of cashing out with a big law firm or a Fortune 500 company? Short of bribery, what else could "undermine ... the independence of the federal judiciary" possibly imply? In the 2006 Report, the Chief Justice argues that the federal bench is on the brink of becoming a mere a stepping stone to lucrative post-government employment. However, isn't this a problem that affects virtually every government lawyer who works in Washington, D.C.? Single family homes in Bethesda, or Falls Church, or Arlington, or Georgetown, are prohibitively expensive on a government pay scale; so is private college tuition (if you want to pay cash). As a result, lawyers at the DOJ, FTC, SEC, EPA, and Capital Hill, etc., now routinely parlay their government service into lucrative law firm and K Street lobbying jobs. So, if a constitutional crisis is afoot, isn't the cancer even more severe in the executive and legislative branches? The Chief Justice has lifetime tenure--if this is the true dynamic, he should speak up. My empirical analysis, and some interesting graphics, after the jump. Yet, is corporate CLO and Am Law 50 partner the proper reference group? On the one hand, Chief Justice Roberts was a partner at Hogan & Hartson (Am Law #21 in 2003) before joining the D.C. Circuit. And last year Judge Luttig departed for Boeing. Presumably, many federal judges have the credentials for these high paying jobs. In 1985, the salary of a U.S. Circuit Court Judge was $80,400. See Lawyer's Almanac, 759-65 (1986). Inserting this figure into the data for the above chart, the change in earnings index between 1985 and 2003 for a U.S. Circuit Court Judge ($80,400 to $164,000; 100 to 204) is slightly higher than the increase for the median law firm partner in his or her 25 to 29th year ($156,368 to $291,682; 100 to 187). The index for the median entering associate was 201 ($36,000 to $72,500). The CPI changed during the same period from 100 to 171, so the salaries of all three groups increased in real dollars. Moreover, as this report documents, federal judges typically make much higher salaries than their state court counterparts. So, unless it takes a lot more brain power to be a federal judge, it appears that we also have several dozen "constitutional cris[es]" at the state level. So the "problem" of judicial pay really hinges on the reference group. Federal judges and most law firm partners and associates have beat inflation by a modest amount, but CLO's and Am Law 50 partners have done much better. 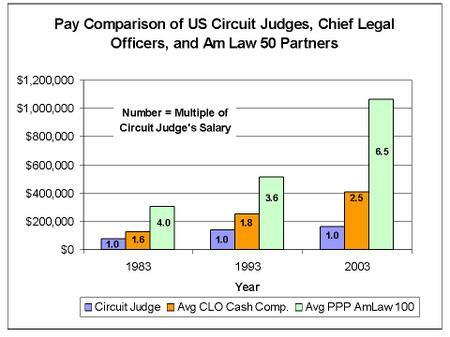 Perhaps it is not surprising that federal judges want to be benchmarked against the highest paid practitioners. But an issue that deserves equal attention is the eroding earning power of solo and small firm practitioners, most of whom would be thrilled with the pay, benefits, and security of being a federal judge. In 1975, the median income of a solo practitioner in the Chicago sample was $99,159 (in 1995 dollars). By 1995, this figure had plummeted to $55,000. In 1975, only 2 percent of the solo practitioners were working a second job compared to 32 percent in 1995. 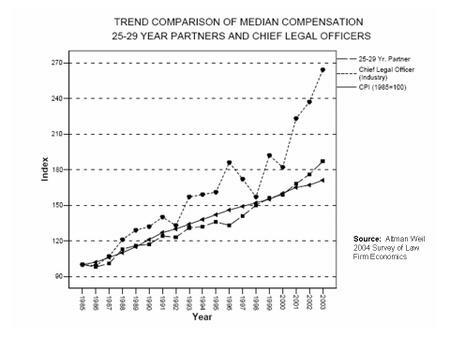 The issue of low lawyer pay is not confined to solo practitioners in Chicago. In Indiana (Chief Justice Robert's home state) in 2002, 74.9% of lawyers in practice practice made less than $125,000 per year. See Report on 2003 Membership Survey, RES GESTAE (Jan/Feb 2004), at 9. Arguably, this low level of pay poses a "direct threat to [lawyer] independence" vis-a-vis clients. Under the current federal pay scale, district and appellate judges working in large metropolitan areas will likely live in smaller homes or endure longer commutes. And the Judge's kids may have to apply for loans to pay for college or law school, including federal Stafford loans, which are the lifeblood of higher education. In other words, their problems will be more like 98% of the American electorate, albeit still very much at the high end. Why is this a "constitutional crisis"? Some of us might call it "sensible policy."